"The Spirit is God's mark of ownership on you. … Since you are God's dear children, you must try to be like him. Your life must be controlled by love, just as Christ loved us and gave his life for us"
Earlier in the year we had our fair share of wet weather. Creeks flooded across roads, the highway was cut by flood waters, houses and shopping centres were inundated. People were unable to get to work or to school. Our church and school yard turned to squelching mud. It’s not often that Australia gets into the news in Scotland but pictures of floodwaters in Morayfield were featured in the daily paper. Walking wet seems to be the normal thing when the heavens open up and the rain buckets down. Stepping outside means an instant drenching. Christians are always walking wet. No, I'm not referring to getting wet in the rain. I'm not saying that you can tell a Christian by their wet hair and soggy clothes. ‘Walking wet’ is an often used expression to describe a person because of their baptismal connection with Jesus. At their baptism water was poured over them and they now walk in that baptism everyday of their lives. Hence the term ‘walking wet’. Of course, the water that was poured on us at our baptism has long since dried up but that water has left in indelible mark on our lives. In those few seconds of our baptism God was beginning something new in us. We received the forgiveness that Jesus won for us on the cross. We received the gift of the Holy Spirit and our lives were renewed. At that moment our whole life was touched with the power of God and something new and different began. Walking wet means God stamped "forgiven" across the length of our whole lives. When we were wet with the water of baptism all of our sin was dealt with. We were made clean and fresh with the forgiveness of Christ. - the “me” who finds it easy to be resentful and find it hard to reach out and be friends to those who hurt me. ‘Walking wet’ means that that kind of me no longer controls my life. But let’s get real here! ‘Walking wet’ is a nice concept – ‘walking in love’ or ‘walking with Christ by my side every day and letting his love affect everything I do and say’ is all very well and a great idea but really how practical is it? Sin really has a firm grip on us and even our best intentions can go so wrong either because of the way we handle things or the way others misinterpret our good intentions. Paul’s theology is great in theory when he talks about our baptism and how we are baptised into his death and resurrection and so sin has no power over me and so live a life in unity with God and his will (see Romans 6:3-11). We know that this is what Jesus has done for us but when it comes to actually living this new life, well. That’s a whole different ball game. The apostle Paul is well aware of the struggle that we have living the holy and righteous life that we should. He keeps on reminding his readers “to get rid of your old self … and put on the new self, which reveals itself in the true life that is upright and holy” (Eph 4:22-24). Paul reminds us the new life we have received through Christ’s death and resurrection, the receiving of the Holy Spirit at our baptism has implication for the way we regard our fellow believers and all people. Repeatedly the New Testament tells us to get rid of every evil thought, word and deed. We heard Paul say to the Ephesians before, “Get rid of all bitterness, passion, and anger. No more shouting or insults, no more hateful feelings of any sort” or any other hurtful thing that has infiltrated our lives. “don’t give the Devil a chance” – a chance to destroy the unity that we have in Christ and the oneness that we have with God through Christ. Then Paul adds these powerful words, “Do not make the Holy Spirit sad” because we keep on ignoring his influence and guidance and let sin and Satan have their own way. “Instead”, Paul adds, “be kind and tender-hearted to one another, and forgive one another, as God has forgiven you through Christ”. These are the qualities that belong to those who are in Christ's company and in your new life. When we were wet with the water of baptism God began something new in our lives. He cleared away the old and brought in the new. He gave us a new life. As Paul says, "If anyone is in Christ, he is a new creation; the old has gone, the new has come!” (2 Cor 5:17). This is not theoretical, pie in the sky mumbo jumbo. This is where the rubber hits the road. This is where our baptism and our relationship with Jesus becomes part of every day. This is about ‘walking wet’ not just when we are feeling all holy and pious but also in the time when our humanity and sinful desires get the better of us. When we were baptised a tremendously intimate relationship was established between Christ and us. It's something like the special relationship between a husband and wife. Every word is spoken and every deed carried out with the special bond that they have as husband and wife in mind. The love that they share controls what they say and do, never wanting to hurt or upset the other. The apostle Paul puts it this way, "Since you are God's dear children, you must try to be like him. Your life must be controlled by love, just as Christ loved us and gave his life for us" (Ephesians 5:1,2a). Just note how Paul states what walking wet means. "Your life must be controlled by love" or as an older translation more accurately says, "Walk in love." 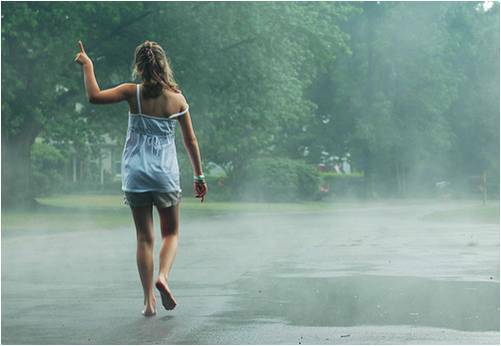 Simply, walking wet means to "walk in love". Walking wet means to know where you belong. You belong to God. You walk hand in hand with God. As Paul says, "You are God's dear children". there's something foundational which holds you together. Walking wet means to realise that the water that wet you at your baptism is God's promise to love you, forgive you, support you and always be there for you. Walking wet means to have a certain togetherness, a certain confidence. There's this thing that holds life together - the thing that says, "I am baptised!" Walking wet implies that you are part of a larger group. Through the water of baptism you have gained brothers and sisters - the people who are sitting with you in this church, in the LCA and in the whole of Christianity. Walking wet gives us a new perspective of those with whom we fellowship in the church. We have all been joined to Christ and to one another through being wet at the baptismal font. Walking wet means walking in love with those who are members of the family of God. Now I don't have to tell you how hard that can be. Congregational minute books in every church record the often bitter struggles that have taken place over the centuries. Even the apostle Paul had to deal with conflict in congregations, settling disputes, and rebuking those who were hurting and abusing others. It is often so hard for us to let the new life that we have in Christ guide and rule everything we do as Christians, especially in our relationship with one another as Christians. We find it so hard to walk wet and let the special relationship that we share as children of God eliminate all the walls that we build up between each other for whatever reason. Paul reminds us that our sinful humanity can too easily undermine the baptismal community - the Church. They destroy and disrupt our walking together as brothers and sisters. Paul says, "I urge you, then, to make me completely happy by having the same thoughts, sharing the same love, and being one in soul and mind. Don't do anything from selfish ambition or from a cheap desire to boast, but be humble towards one another, always considering others better than yourselves. And look out for one another's interests, not just your own." (Philippians 2:2-4). Every now and then something arises that touches raw nerves, upsets people, causes people to make threats about leaving the church and all sorts of other things that undermine the baptismal bond that we share. It is Satan’s joy and delight to drive wedges between those who are brothers and sisters in the water of baptism. It's easy to forget that walking wet means to walk in love, looking after one another's interests not just our own (Phil 2:4). Walking wet means that renewal is a continuous event. Daily we need to repent, admit that we are too willing to resurrect our old ways. Daily we need to be forgiven. Daily we need to return to our baptism and be renewed and reoriented. Daily we need to be reminded what it means to walk wet together as God's people. Christ has called us to this life together, a life marked by forgiveness, encouragement and love. He has called us to walk wet, to walk in love, in forgiveness, in newness as one of God's dearly loved children. Next time you splash water on your face or step under the shower think about the water that once touched you and brought you into God's family and gave you forgiveness. Remind yourself of the love of God that reached down and claimed you as a member of his family. As you stand there with water dripping off you think about what it means to walk wet - to walk in love of Christ every day. With God's help let us walk wet!